What is the minimum specification for a Chromebook computer to suit your needs? 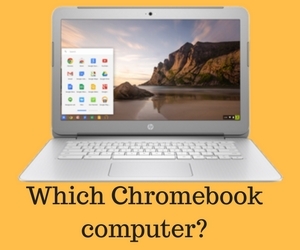 Copy the results and see which Chromebook computer suits you. Cheaper laptop style computer. Limited expansion options. Start time is under 10 seconds. Internet connection needed for many apps. Can be used without mains power for 8-12 hours. Slow Internet can slow applications. Google office suite included + cloud storage. Costs for more than the free 15 GB cloud storage. Self updating. No Anti virus needed. Applications are mainly website / cloud based. Very low power consumption. < 20 Watts. Lower performance compared to a laptop. Chromebook Display LCD Monitor A HDMI port and cable can be used to connect to a larger monitor. External Mouse Optical mouse have less maintenance issues. Web Camera Used for video conferencing. Many Chromebooks have a web camera built in. Very small sized flash drives can be used to extend Chromebook storage. For a single computer use a USB external drive. USB Flash drive 8 GB to 128 GB. Printer Print documents or photos Printer must be Google Print compatible. Inkjet or mono laser or colour laser printer. Sound For music, VOIP communications, video conferencing etc. Can be headphones or USB headset with microphone Audio connectors assumed on all computers. Many Chromebooks have webcam, microphone and speaker built in. 3G Wifi modem Most Chromebooks use Wifi and requires a broadband router that supports Wifi. Wireless 3G modems may suit when other broadband types are unavailable. Wireless Ethernet ac/a/b/g/n standards for house area. Mobile 3G /4G for city wide coverage. School, library, university may have Wifi available also. E.g. Templates, plug ins, ecommerce. A Chromebook needs a wireless Ethernet WiFi connection to the Internet. The wifi network name and password is needed for a connection. There are multiple wireless network standards available AC B G N. G is most popular and also handle B protocols. AC is fastest but a relatively new standard. All wifi components need to work to one standard. If the building is very hard to cable and the solid walls are too thick for wifi, then Ethernet adapters can use the house mains wiring as a communication medium. These are expensive and relatively slow. Wireless Access Points and Wireless repeaters can be used to extend the wired / WiFi network. For a new Internet connection the options include ADSL, cable, Fibre NBN, Wireless NBN, Satellite NBN and mobile 3G/4G. Appropriate hardware and possible cabling need to be considered. Chromebox - Small box like Chrome computer that requires an external screen, keyboard and mouse. Often uses wired Ethernet connection. Useful for computer kiosk or office location. Chromebit - Very small HDMI / Micro USB Chrome computer that plugs into the back of a monitor or television. Uses Bluetooth for keyboard and mouse. Wifi is used for networking. Thin Client / Remote Desktop A Chromebook can use Chrome RDP application to log into a Windows Server and use a Windows 7/8/10 virtual machine instance. Cloud Based Application User A Chromebook can use Office 365 (cloud) Word, Excel, PowerPoint, OneNote, Sway, Mail, People, Calendar and One Drive cloud storage. You need a Office 365 paid subscription. Group Business Office 365 subscriptions can share documents. Chromebooks for Education Chromebooks for a school can be managed as a group. Multiple users can share Chromebooks each with their own individual login. Documents are stored in the cloud.